My pretzel craving has been crazy since that week I was sick last month and ate just pretzels and crackers. Even crazier is my craving for peanut butter and pretzels! If you follow me on Instagram you’ve probably seen this in my stories with my pb dipped pretzels and even pretzels in my pb&j sandwich. It’s bad. 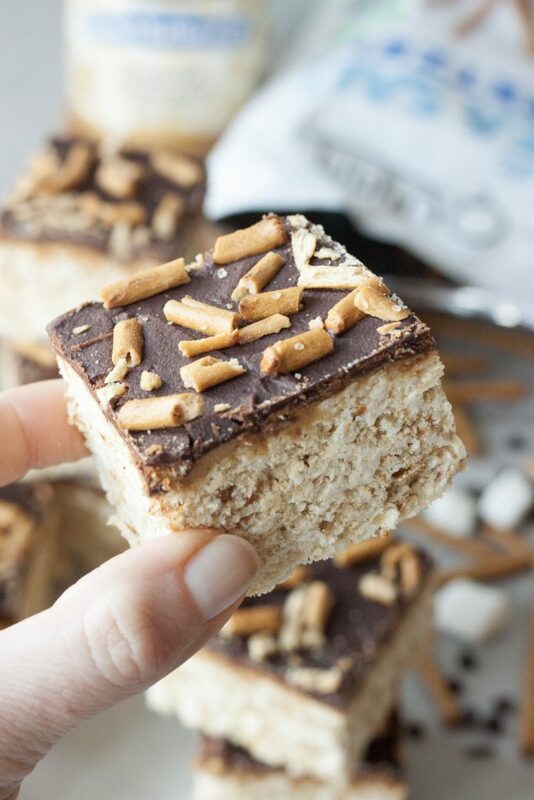 Last week I posted my SuperCali Sea Salt Chocolate Caramel Crispy Bars which are good don’t get me wrong but all I could think about are these WhatTheWhat Peanut Butter Pretzel Crispy Bars! So you’re probably like, what but if you were A you’d be like What The What?! She is like her mama and loves peanut butter and chocolate together and girl loves her pretzels too. It was only fitting to have them named after her expression and our excitement because yes we really went there with these bars and they are real, really good! A and I were all over these bars! To be honest the whole family was because there is no way we devoured the pan that quick, not that we couldn’t, but we didn’t. These are the ones that sit there, and I even hid them in the fridge, yes mom I know they don’t go in the fridge but I don’t like them soft that scream you name. The ones you go and cut just half a bar only to eat the other half an hour later. I’m telling you the cravings are crazy lately and I’m breaking out the peanut butter and pretzels daily. Even if it’s just a few pretzels and a tablespoon of peanut butter. Reminds me of my teenage days grabbing a spoon when I got home from school and sticking it in the jar of peanut butter and rolling it in chocolate chips. So good! We all have our thing. My brother would take the leftover jar of chocolate frosting my mom seemed to usually have around and he would spread it on graham crackers and make frosting and graham cracker sandwiches. All the things we did as kids and teens I’m pretty sure we all had them. I wasn’t a fan of frosting then and the thought of frosting and graham crackers still grosses me out. Rice Crispy Bars are a childhood classic, they bring back so many memories like ones I shared above, but they aren’t something I crave. I know some friends that do though. My mom did however use to make ones where she would stir peanut butter into the marshmallows and then add the cereal and put chocolate on top of. Those I loved! However my palette is more sophisticated now, haha and I need layers and pretzels for saltiness and crunch! Kidding of course because I’d eat one of her bars any day. These WhatTheWhat Peanut Butter Pretzel Crispy Bars are just the perfect amount of sweet and salty which is my weakness. 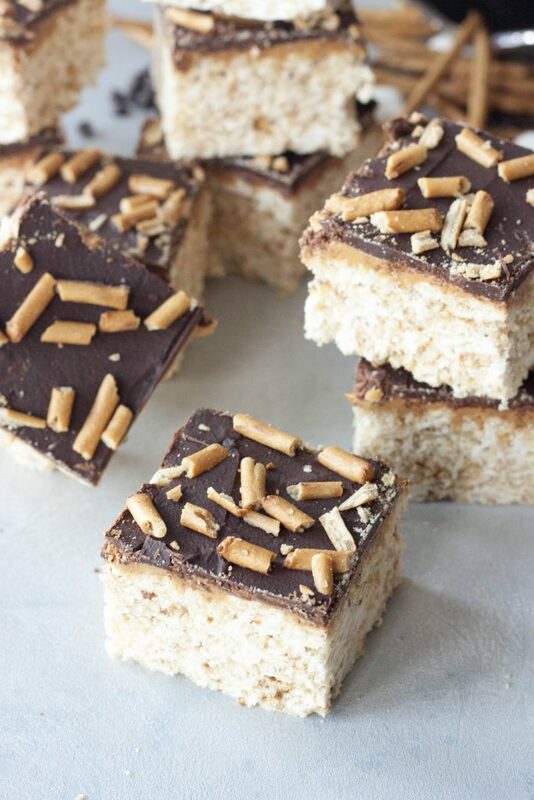 The crispy bars even have pretzel pieces sprinkled throughout, then top that with a nice smooth layer of peanut butter, top that with chocolate, then more pretzels for crunch and saltiness not to mention they make them visually appealing. So as I sit here writing this post I wonder what are your cravings or weaknesses, are they the same as when you were younger? Are you more of a WhatTheWhat Peanut Butter Pretzel Crispy Bars or a SuperCali Sea Salt Chocolate Caramel Crispy Bars lover? Not that there really is a right choice because you can’t go wrong with either. Take either to your next party or get together and everyone will love you! Oh yeah and I made these with gluten free and vegan ingredients so pretty much anyone can enjoy them (except those with a nut allergy in which you can try to sub a sunflower butter). *For the crushed ones you want very small pieces and not powder but nothing larger then a 1/4 of a pretzel stick. For the rough chopped these are for the topping. It’s even fun to see if you can break sticks into 4 pieces racing with your kid to get through a stack. 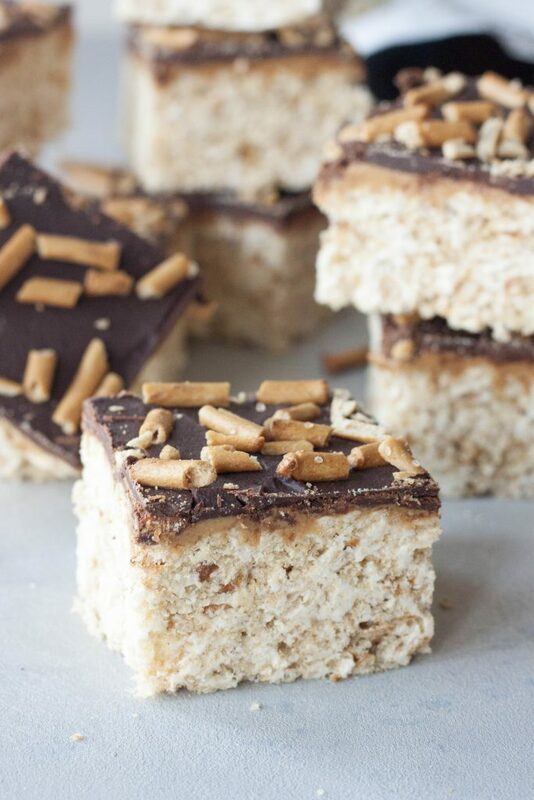 Note: These can be made into a 9×13 pan but will be much thinner and you will want to use a little more than a cup of peanut butter and increase the mini chocolate chips to 1 1/3 cup and add an extra scant 2 teaspoons of coconut oil. Prepare a 9×9 pan lining it with parchment paper, set aside. In a bowl mix together the rice cereal and cup of crushed pretzels. In a large microwave safe bowl melt marshmallows, 2 tablespoons of coconut oil, and butter in 30 second intervals, stirring in between, until melted. Once melted stir in rice cereal pretzel mixture and until mixed well coated. Press mixture into prepared pan. Smooth and press with a non stick coated spatula. Spread peanut butter on top of bars. You want a nice layer so you can’t see the bars but not too much as it will squeeze out the sides when you cut them. Melt chocolate chips and remaining 2 tablespoon of coconut oil in a microwave-safe bowl. Heat in the microwave in 30 second intervals, stirring between each one, until melted and smooth. Spread chocolate over the peanut butter and sprinkle with chopped pretzels. Let set before cutting. To speed up you can place bars in the refrigerator for 20-30 minutes to set. Using a sharp knife carefully cut the bars. Enjoy! I love chocolate and salty pretzels and PB together! I just want you to live near me and feed me goodness all the time. This sweet and salty combo is divine! We are so in sync – I was just planning a chocolate-pb-pretzel recipe for some work I’m doing! Now you’ve got my brain spinning with the crispies added to the equation. I love all the ingredients! 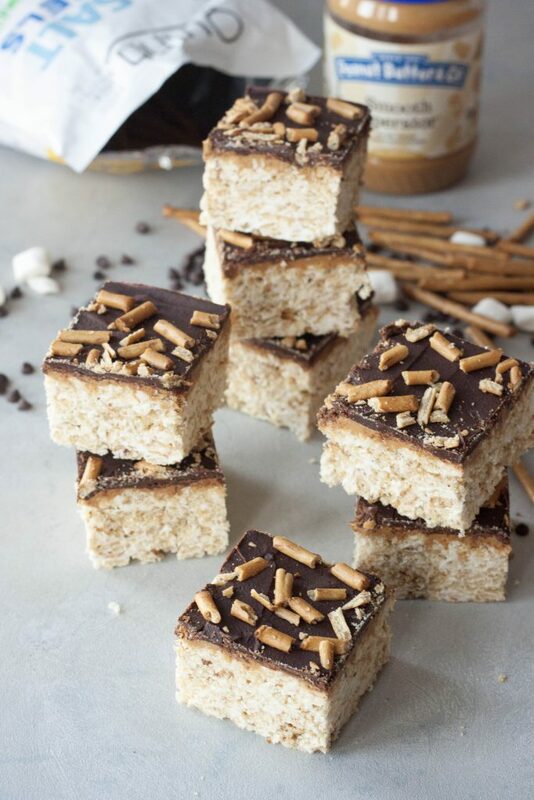 Marshmallows, PB, pretzels – Yum! Alicia Pope recently posted…Naturally Dyed Easter Eggs – Make your Own Food Dyes with Food!